KUALA LUMPUR—Richard Gasquet, the eighth best tennis player on this planet, could hardly believe his French eyes. He was standing on the baseline, in control of the point, when he lobbed a high ball above Rafael Nadal’s head. Surely, Gasquet thought, even if Nadal stands an imposing 6-foot-1, there was no way the Spaniard would retrieve the ball. But the three-time French Open champion spun a U-turn and sprinted for the baseline. And, just when the ball was a foot high from landing on the ground, he flicked an in-between-the-legs shot which zoomed across the net—for a winner! And that wasn’t on YouTube. 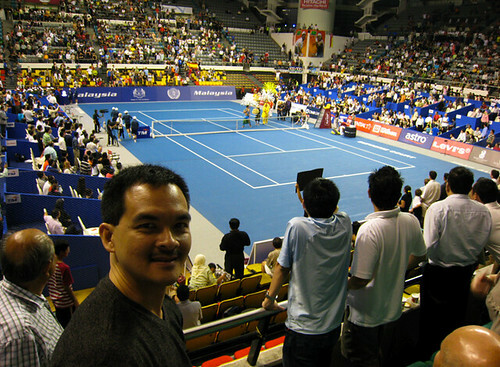 It was “live” at the “Clash of the Titans” match here at Malawati Stadium in the city of Shah Alam (about 45 minutes from Kuala Lumpur). 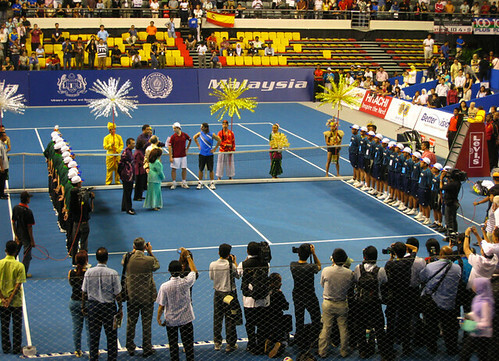 This whole week in Malaysia is all about one word: TENNIS. There’s a junior event (which four Cebuanos are joining: Nino and Em-Em Siso, Jacob Lagman and Mac-Mac Tabotabo). There’s the Malaysian Open (where the likes of Max Mirnyi and Rainier Shuttler are top-seeds). And, of course, the twin events of Nadal-Gasquet and Pete Sampras vs. Roger Federer (tonight at 8 p.m.). Last Tuesday, we left the Hotel Capitol at 5 p.m. when our Malaysian friend Albert Low (whose son plays in the junior circuit) picked us up in his Volvo SUV. There were 10 of us crammed inside: Albert and his son Kevin, my wife Jasmin and I, Dr. Ronnie and Steph Medalle, Mark Aseniero, Titus and Mac-Mac Tabotabo, and Dodong Ruelan. We passed by a local eatery for a dinner of noodle soup and arrived at Malawati Stadium by 7 p.m. The entire block is a sports complex, with a giant soccer field right beside. As we arrived, we snapped photos beside giant billboards, then, at exactly 8 p.m., never mind if the stadium was less than half-filled because of the traffic jam outside, the festivities began. An ethnic group banged it’s drums and a local boy band performed a few songs. Then, with lights swirling around, the two warriors entered: Gasquet first in a red Lacoste outfit, Nadal next in his patented sleeveless shirt and capri shorts. We sat at the arena’s middle section and paid 253 ringgit (around P3,300/person)—good seats inside the 12,000-seater indoor arena. Before Rafa and Richard warmed-up, they flung autographed tennis balls to the spectators. Believe it or not, of the two dozen balls they scattered, guess who caught one? Dr. Ronnie Medalle! A ball signed by Nadal! Next, it was Show Time. Now, if you think these two youngsters would relax, laugh, do a high-five in between games, and not scramble for every shot—that’s wrong. They fought like it were Wimbledon. In the first set, Gasquet scored. He broke Nadal’s serve with his 205-kph (yes, there was a radar gun) and won the set, 6-3. But Nadal wasn’t giving up. With his trademark forehand, he smothered the ball from corner to corner. Second set to Nadal. In the final set, they elevated their games; tennis at the highest quality. And then the point of the match—when Nadal squeezed a ridiculous in-between-the-legs winner to break Gasquet’s serve. Final score: 3-6, 6-2, 6-3. 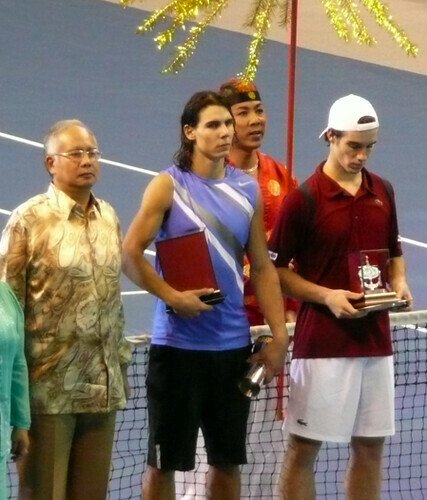 Winner: Rafa. The Deputy Prime Minister of Malaysia (below photo, left most) came down the court for the awarding while I scurried to the lower level to take photos. Then, the two players—R and R—thanked the crowd in their speeches while we all stood and applauded. Perfect ending. But just as we exited the arena and walked to the parking lot, a noise grew from a nearby door. That’s when we realized: that’s where Nadal’s exiting! And so we joined the hundred or so fanatics, squeezed ourselves amidst the crowd like little boys and girls awaiting a Mickey Mouse pictorial, held pen and magazine ready for an autograph, and waited. Five minutes. 10. 15. 20 minutes. No sign. Finally, after half-an-hour, with guards pushing us to part a Red Sea for R and R to pass, Nadal emerged. We clicked a few photos as Rafa flashed his boyish smile and disappeared in the back seat of his Mercedes.